On the 22nd December 2016 we heard the sad news that Brian had passed away following a short illness. He had celebrated his birthday two days earlier on the 20th. 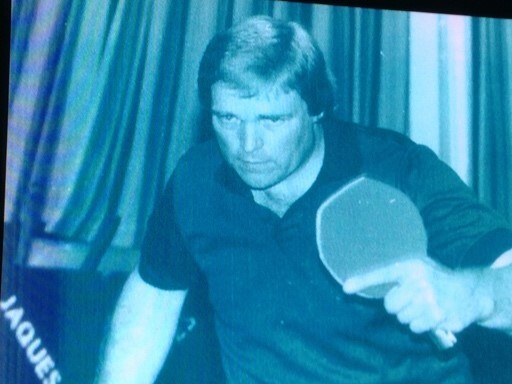 Brian was a top class table tennis player who represented both Dagenham and Essex as well as running a highly rated table tennis club called Milestone, in the East End of London from which many players benefited and reached a high standard. I personally first met Brian when I was eight years old when he used to take me to West Ham United along with his close friend Eddie Sawyer and he ensured I was passed down the front to see the match; something I will never forget. In later years I played against him on a number of occasions in table tennis matches in the East London League and these were all very competitive particularly when I lost to him in the Milestone match room (called the art room) when I was at the peak of my playing days. In later years Brian ran and helped organise the Dagenham FC Table Tennis Club in the British League and along with Jimmy Cleeves and Peter Cranmer made playing such a special occasion with coaches of supporters travelling to away matches throughout the country. 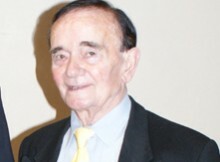 Brian was an avid supporter of Dagenham and Redbridge FC and attended weekly with his grandchildren and was subsequently made Vice Chairman for his services. In closing how will I remember Brian? Yes, he was competitive, but along with that came a thoroughly special human being who would always have a smile and would help anyone who asked. Brian you will be sadly missed by many, many people especially your wonderful family. After a gap of some 8 years, the ECTTA Annual Closed Championships for Seniors, Vets and U21s returned. It was held at the Rayleigh Leisure Centre, in Rawreth, home of Southend’s Annual Closed Championships. A good Entry of 68 Players, combined to produce a very good Championships. Our thanks go to the Staff of the Rayleigh Leisure Centre for making us so welcome and always being on hand, should any problems arise. Thanks also to Jayne Johnson for producing the various Result and Match Sheets & for organising the Control Desk for the 3 days. Running the Desk for Saturday & Monday along with Jayne and Barrie Delf was Arthur Clark. Jayne & Ken looked after the Desk on the Sunday which was the Vets O40’s day. Our thanks to Anthon Ranjit-Singh for the helping setting up and taking down the Match Room and helping throughout the Tournament. Finally a big thank you to all of the Players & their families who supported these Championships. On Saturday we enjoyed the Men’s, Ladies & Under 21 Events. In the Men’s Singles Semis, we saw two five setters, with both going to the wire. In the first, Tony Halling just edged out Lukasz Lewandowski -8, -6, 6, 4, 10, but not before he had a Match Point. A similar story in the other Semi with Josh Dye just beating Ben Warner -7, 5, 9, -9, 6. In the Final it again it went all the way with Josh just taking the Title from Tony –6, 8, 3, -9, 8. 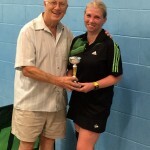 In the Ladies Singles, we had a Round Robin, with Lin Roff, Gracie Edwards & Rebecca Lowman each winning two matches. In the count back the Title went to Lin who won 7 Sets, losing 3, with the Runner up position going to Gracie 7-4 and Rebecca 6-4. The Men’s Doubles saw a good Final with Doubles specialists Gary Young & Glenn Johnson just losing out to Father and Son combination, Andrew and Tony Halling -9, 7, 5, -7, 3. The Ladies Doubles was won by County Juniors Gracie Edwards & Rebecca Lowman, who beat Lin Roff & Tina Hutchinson 5, 5, 11. 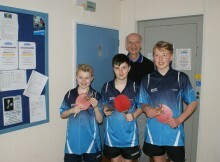 The Mixed Doubles was also won by two of the County’s leading Juniors. 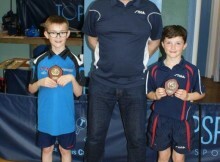 Jack Stockdale and Gracie Edwards beating Norbert Fullerton & Lin Roff 8, 7, 6. 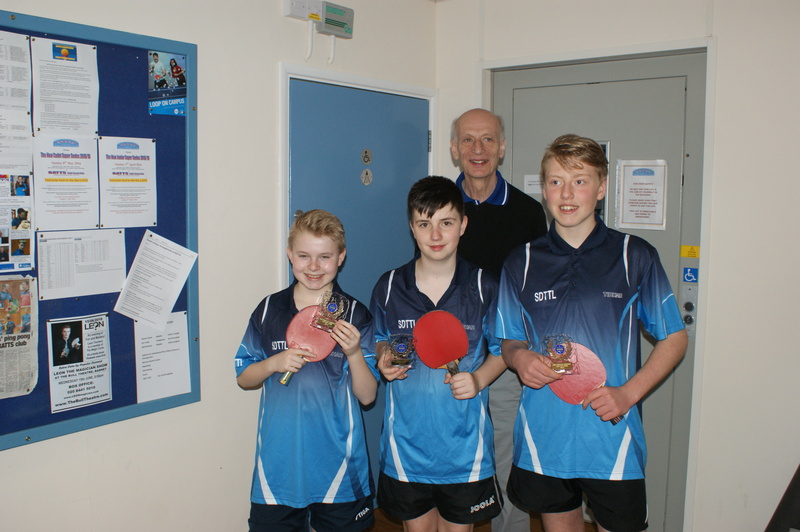 Next was the Under 21s, which saw Josh Dye repeat his victory in the Men’s Singles, beating County Junior, Sam Hume in the Final. He didn’t have it all his own way and a tight Final saw Josh just take the Title -5, 10, -5, 8, 6. 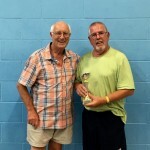 The final match on Saturday was the Level 2 Open Singles and this was won by John Cleasby, who beat Paul Pells 12, 8, -8, 7. Day 2 of the Championships saw the Over 40s take centre stage and we enjoyed plenty of good matches. In the Men’s Over 40s Singles, there were shocks as un-seeded Django Fung took the Title. Django, who is more renowned as the Manager of Ronnie O’Sullivan and Judd Trump, turned his attention to Table Tennis. In the top half of the draw, No. 1 Seed Rik James lost a close five setter to Mark Wicker, only for Mark to lose in the Semi-Final to No. 4 seed, Gary Young. In the bottom half of the draw, there was an early shock when No. 3 seed Kevin Read, lost in straight sets to unseeded Django Fung. 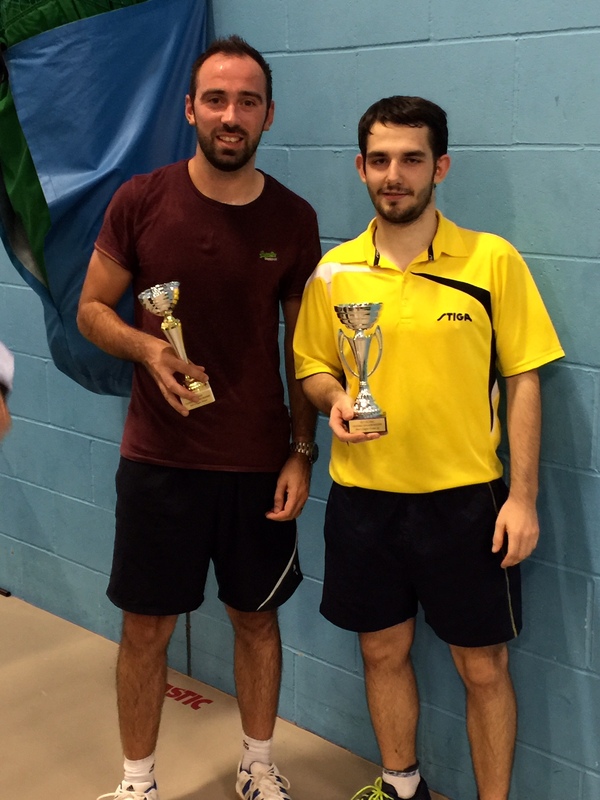 Django then beat Southend Premier Player, Babul McLeod, again in straight sets. The Final was a very tight match poised at two sets all and 9 all in the decisive fifth Set, before Django took the Title 9, -12, -5, 6, 9. This was the shock of Championships, great effort by Django. Is this a Yellow Card moment!! 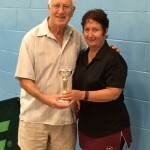 The Ladies Over 40s Singles title went to Jan Fuller who beat Tina Hutchinson 9, 6, 7. 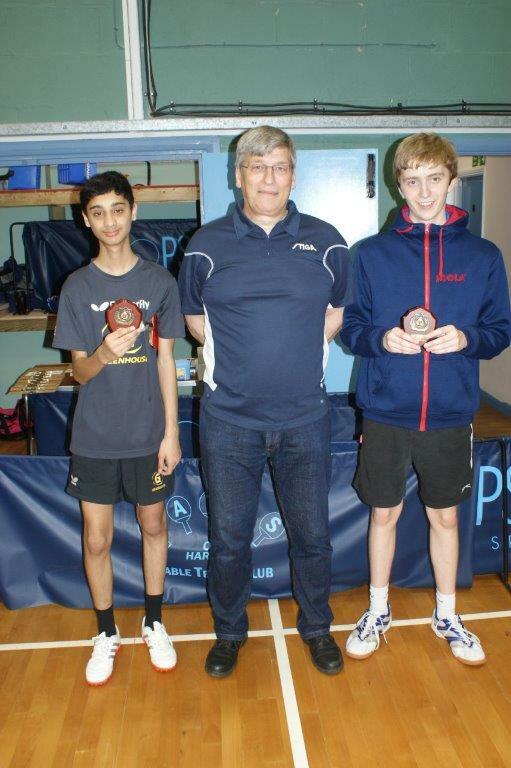 Both players have returned to our sport after many years out: having both been leading juniors in the County. 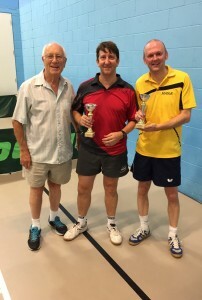 The Over 40s Doubles was played as an Open Event. Favourites Mark Wicker and Paul Davison justified their Seeding and took the Title, beating Gary Young and Glenn Johnson 8, 8, 6. Final Event of the day was the Level 2 Over 40s Open Singles, which saw Southend Premier Players Norbert Fullerton and Richard Brown face each other in the Final. It was a very good match with Norbert just edging it 5, 11, -3, 11. On to Day 3 we enjoyed watching the Over 50s, Over 60s and Over 70s. 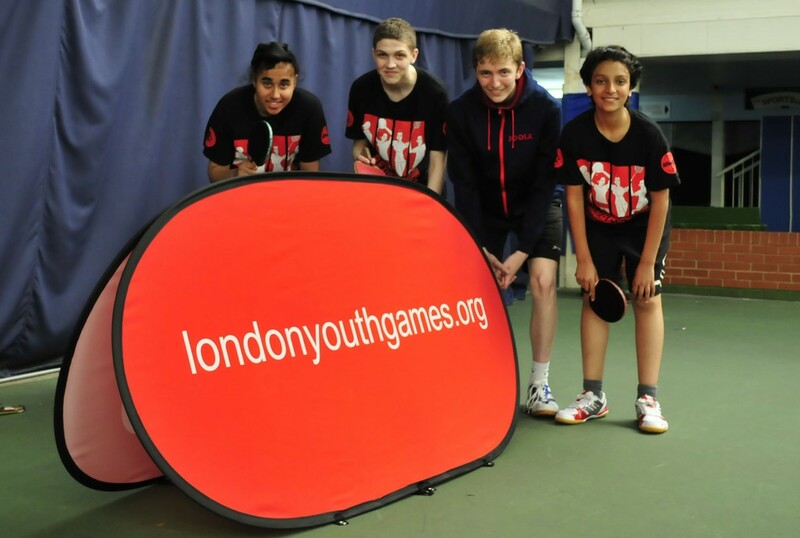 There were plenty of exciting tussles and it was a great demonstration of how Table Tennis is a sport for life. 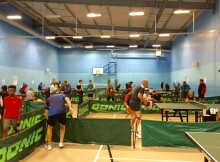 Each event was played as an Open event: with the Over 50s in Groups and the Over 60s and 70s as straight knockouts. 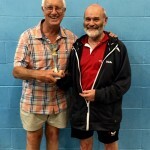 In the O50’s Alex Abbott and Rick James met in the Final and we enjoyed watching a close five setter, with Alex just beating his long term rival and friend Rik 9, -9, 9, -2, 6.
n the O60’s, after reaching both the Men’s and Over 40s Doubles Finals, but just losing out in each, Glenn Johnson went one better this time to take the Over 60s Title, beating Peter Cranmer in the Final 7, 8, 8. 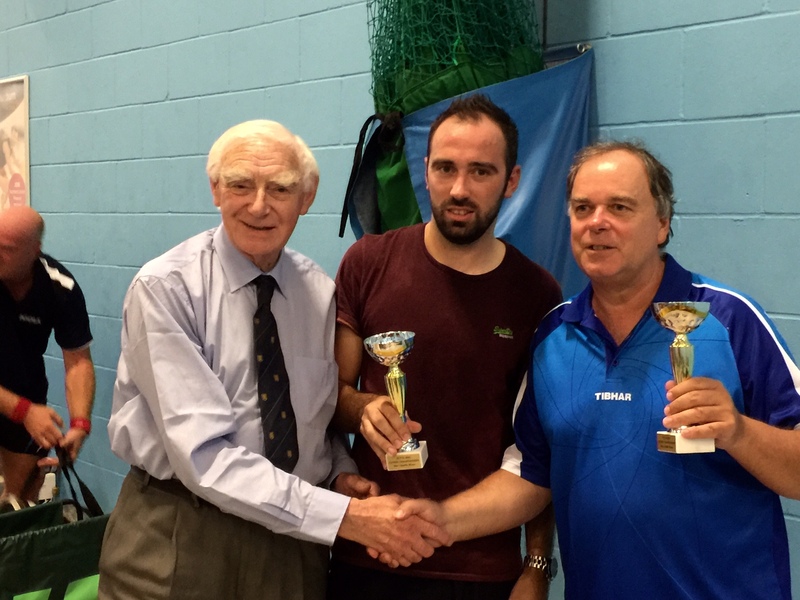 In the O70’s Peter Cranmer made up for his disappointment in the Over 60s beating Bill Smith in the Final -6, 7, 4, 9. It was great to see these two stalwarts of our game still maintaining a high standard of play. 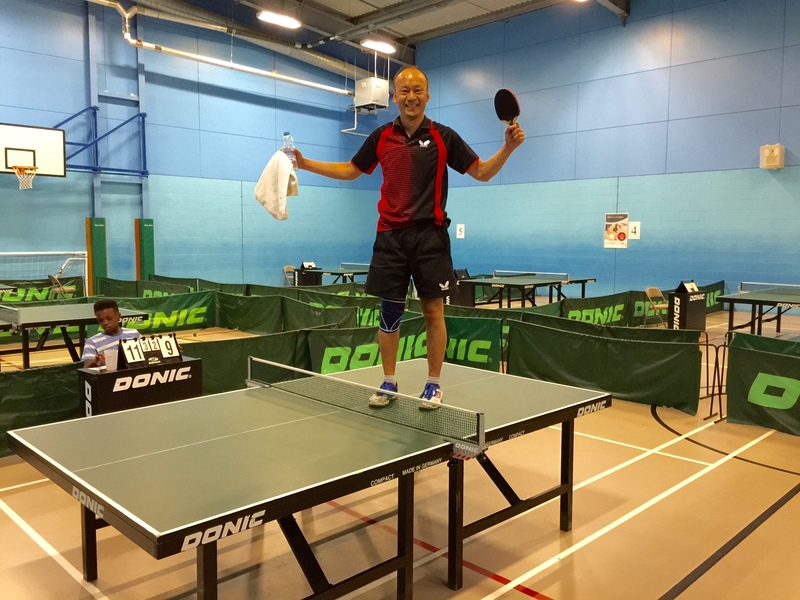 This concluded the 2016 Essex Closed Table Tennis Championships and several of us enjoyed a final beverage in the Canteen at the Rayleigh Leisure Centre, which had been a great meeting place the whole weekend. Throughout, the staff had been so helpful and accommodating. John Dennison of Topspin Sports arrived to collect the tables and equipment and those left helped load up the Van: including the legendary Joe Kennedy who called in on Sunday. There has been some good feedback about these Championships which will be fed back to the Essex Management Committee and it will be up to them to decide if this event can continue. The running of this event has to receive funding from the County due to the cost of Venues and Equipment hire. The funds of the County are a combination of our current Funds plus the Annual Team Fees of £9.00, paid by every Local League Team that plays in our County. This means that every registered player in Essex contributed a small part towards the running of these Championships. So our thanks go to every player, playing in the Local Leagues of the Essex County. We enjoyed setting up these Championships and thank all of you in what ever way it was that helped make the return of these Championships such an enjoyable weekend. To all Players who play in the Essex Local Affiliated Leagues and Clubs (players must qualify to represent Essex). over the August Bank Holiday period of 27th, 28th & 29th August 2016. You can download the attached Entry Form HERE (Excel Form) if you wish and return it to Ken Field, the address is shown on the Entry Form. Closing Date for Entry is Friday, 29th July 2016 and Entries will be on a first come, first served basis, with a probable maximum of 120 players each day. The Venue is the Rayleigh Leisure Centre, Priory Chase, Rawreth Lane, Essex, SS6 9NF. There is ample free Parking, nice clean Changing Rooms and a very pleasant large Cafe. 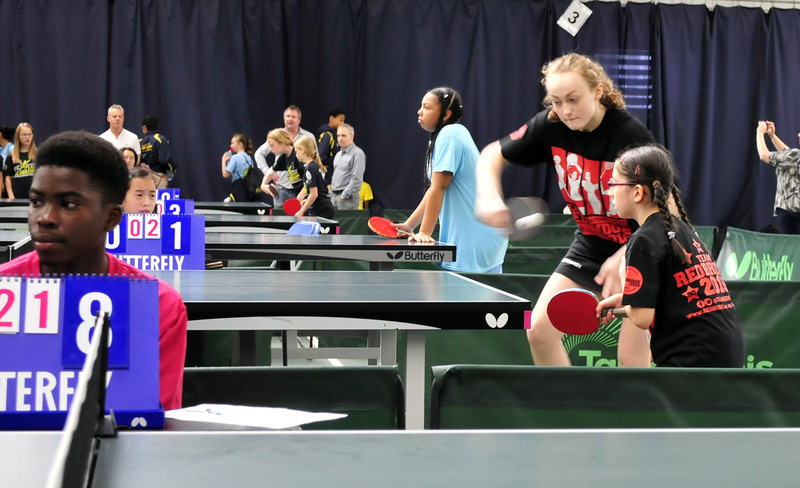 There is a good playing area, where the Closed Championships of the Southend & District Table Tennis League have been held for the past 7 years, with an average Entry of 120 players. 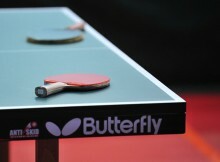 Play will be over 10 Tables, supplied by Topspin Sports. 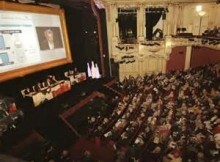 Play will be continuous from 9.00 am – 6 pm each day. 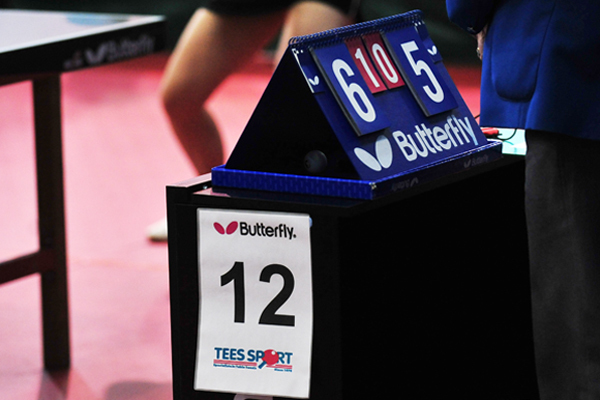 Men’s & Ladies Singles, Men’s & Ladies Doubles, Under 21 Men & Ladies Singles. 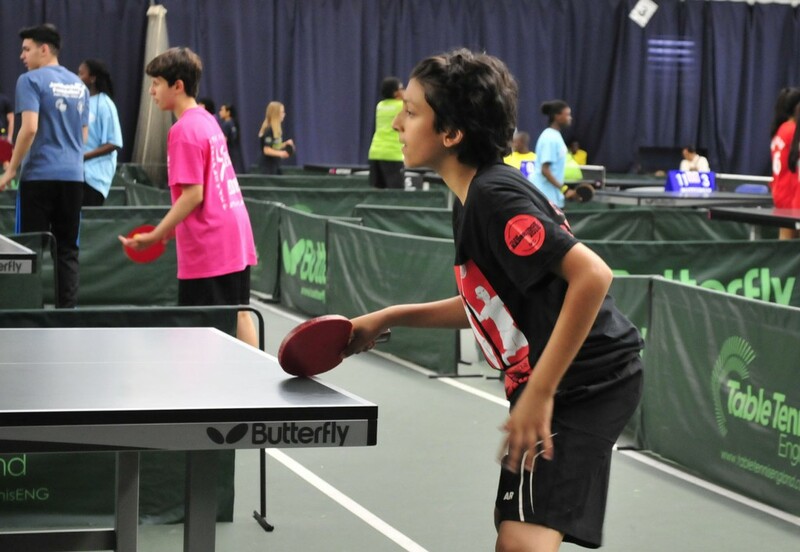 Plus an Open Plate Event for those knocked out in their Groups, or Round 1, of the Men’s & Ladies Singles. Men’s Vets Over 40s Singles, Ladies Vets Over 40s Singles, Open Vets Over 40s Doubles and an Open Plate Event for those knocked out in their Groups, or Round 1, of the Vets Men’s & Vets Ladies Singles. Open Over 50s Singles, Open Over 60s Singles and Open Over 70s Singles. All matches will be played up to 11 points and best of 5 sets and all Events will be played in Groups of 3. The Plate Events will be played on a straight Knock out basis. The Entry Fee for each Separate Event is £ 8.00 per Singles Event, £4.00 per person for Doubles Events, Plate Events free. Trophies will be presented each day. 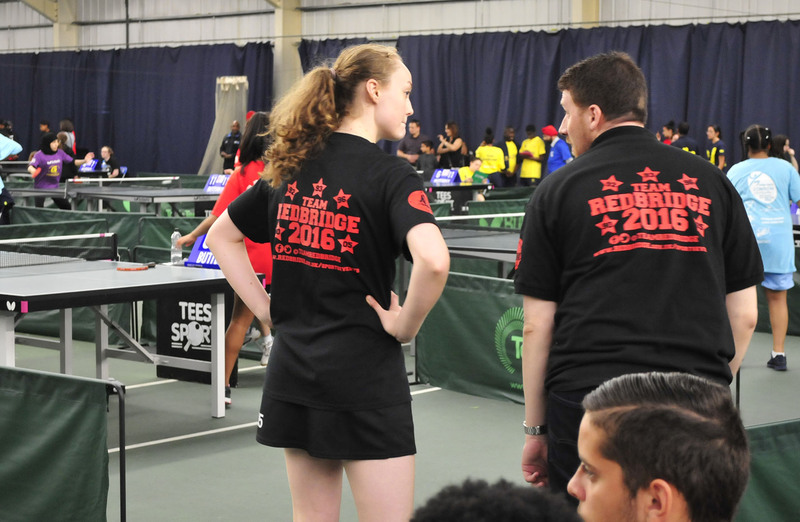 Note, there will be no Table Tennis England Ranking points given for these Championships, nor Cash Prizes, the aim of this Event is to provide good Table Tennis, coupled with a good Social atmosphere, as a nice start to your 2016/7 Season in Essex. Any player under the age of 18, on the 27th August 2016, wishing to enter the Closed Championships, must enter by Entry Form and their Entry Form must be signed by their Parent or Guardian and returned to Ken Field, address is on the Entry Form. 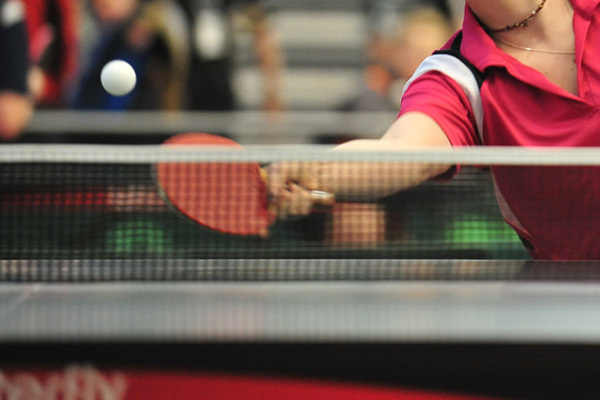 The Southend and District Table Tennis League is running this Event on behalf of the ECTTA and therefore BACS payments and Cheques should be made payable to the SDTTL Bank Account, with eventual Profit or Loss being passed on to the ECTTA. * Payment must be received by the Closing date of Entry of the 29th July 2016. Any questions do email Jayne and/or myself. This is the first time the ECTTA have run this Event since 2010 and it is an experiment to gauge whether it’s economical to run such an Event or not. We hope you’ll give this your full support. Even if you’re not playing, do pop in and see us. 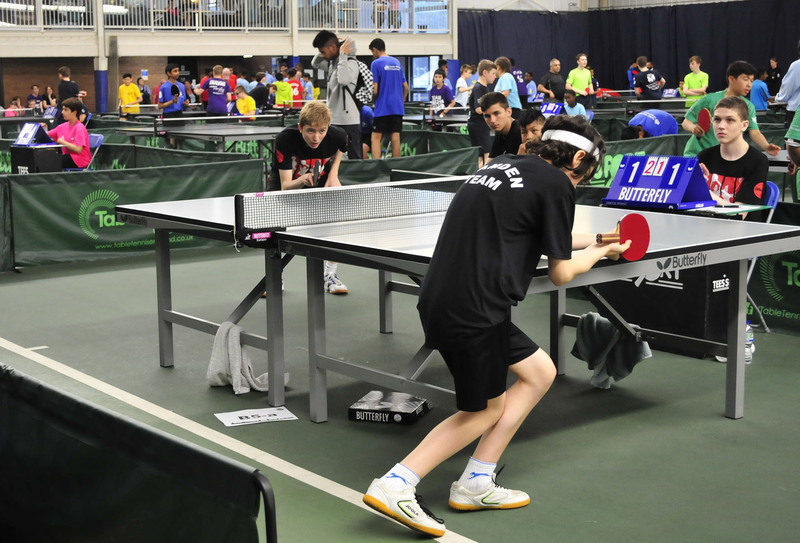 The Dates were chosen because the Venue was available and there is nothing else going on in the Table Tennis England Calendar over that weekend, although at the very last minute, Table Tennis England have included British League Senior Division on the Saturday. We fully realise that it’s a risky move running this Event over a National Bank Holiday period, but we are giving it our best shot and our President, Stuart Gibbs, recalls it once being run at Clacton, during the Easter Bank Holiday Weekend, with a great turnout and atmosphere. Looking forward to seeing plenty of you there. 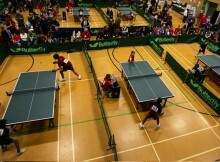 of the Essex County Table Tennis Association. We have now been advised of the funeral arrangements for Lou. Friday 1st July - 11.20 at the Southend Crematorium – family flowers only please but donations would be welcome to the Essex and Herts Air Ambulance Service. There will be a reception at Rayleigh Lodge from 12.30. It is with great sadness that we heard the news that Southend stalwart for so many years, Lou Hopkins, passed away peacefully last Thursday 2nd June. As soon as we know when the Funeral Service is and the details we will publish here. Our thoughts are with his Family and friends at this sad time. Lou has been involved with local Southend Table Tennis for over 50 years. He played in local leagues, Southend, Basildon, Chelmsford, Burnham and Brentwood. Always happy, always looking to help out wherever he could. In Southend, Lou has done several roles for the Committee; running the Summer League for many years, the RoseBowl Competition, Closed Championships and has always looked to help wherever he could. In more recent years, Lou looked after the League’s Finances and always produced immaculate Books. In his early days, Lou played for ‘Inflight Cleaning’: who were based at Southend Airport, who he also worked for. Later the Club switched to Rawreth where he continued to play for many years, ending up with the RESSC Club. Lou ran Junior Coaching classes at the Southend Leisure Centre for several years and coached at various schools. In the 90′s, he, together with Stuart Gibbs, Roy Savill, Paul Reed and Bill Wall, set up Setts in the Basildon League area, which he ran for many years, right up to the more recent months, when ill health got the better of him. Lou was always a mid Division player, always capable of good wins, never complaining if he lost and always congratulating his opponent if he lost. Lou was liked wherever he went. Lou will be much missed by all. Please do your best to see that your League is represented at this year’s AGM so that your League’s views are catered for. Please note that players who wish to collect their Inter-League Trophies at the AGM will be most welcome. 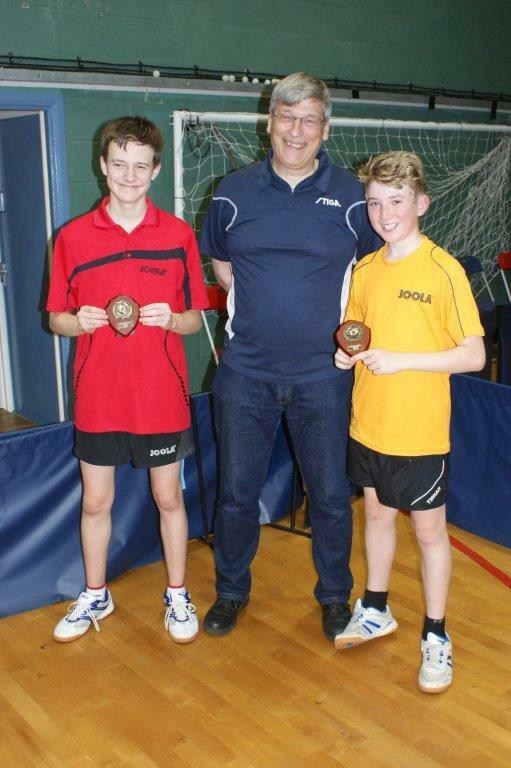 The Essex Cadet and Junior Inter league competitions for Season 2015/2016 were held at BATTS Harlow on 2 April 2016. 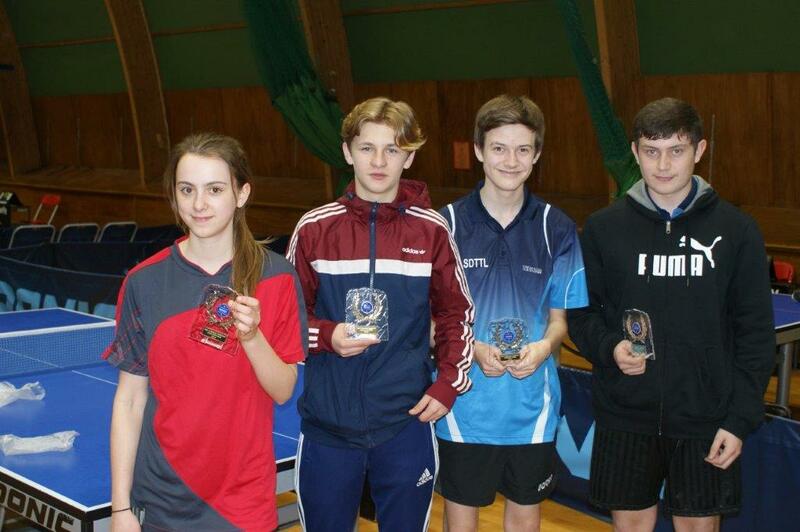 Four Essex Leagues took part in the Junior event, Clacton, Colchester, Harlow and Southend. Only two teams, Harlow and Southend took part in the Cadet event. Thus there were three rounds of matches to be played in the Junior event and just the one match in the Cadet event. All matches were played on two tables. The Junior format was four players with each player to play two singles and one doubles thus giving a ten match format whilst the Cadets format was three players, nine singles plus one doubles. 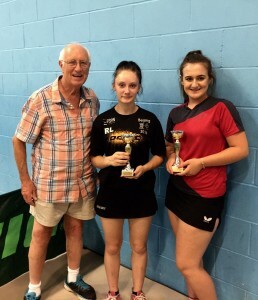 Also at the same time the final three matches in the County Championship Division 1B took place and three players, Sam Hume Zoe Davies and Gracie Edwards played in this event and the Junior Inter League event. The one match between Southend and Harlow resulted in a Southend win 8-2. Diesel Harvey won the two matches for Harlow, -11, 5, 8, 12 against Daniel Zeffie, and 3-2 over Reece Harris-Griffiths, the umpire failing to put the game scores on the Match sheet for that match other than 11-8 for the deciding game, and a 3-0 loss to James Goddard. Lorcan Neville took a game off Reece and Southend won all the others 3-0. Harlow’s other player was Cody Prentice. The second round of matches saw another whitewash by Southend, this time over Colchester. 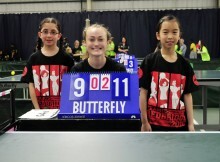 Zoe had the toughest time with her two five game wins over Lewis and Cameron and Leon just failed to take Matthew Stringer to a fourth game when losing 12-10. 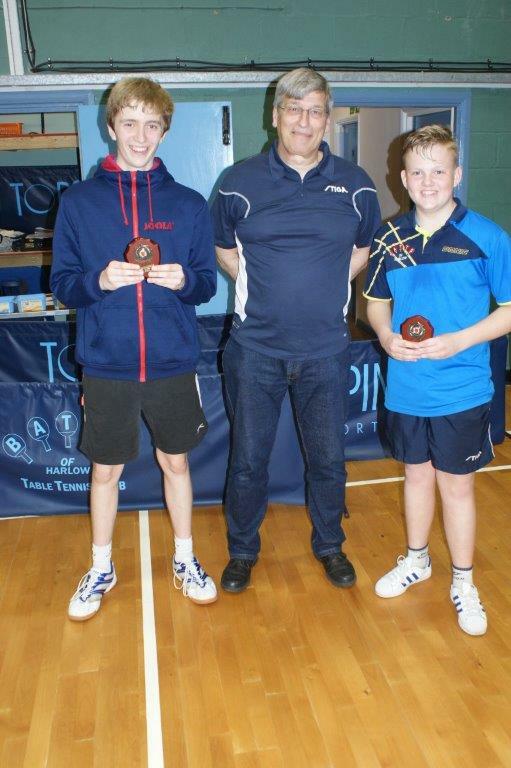 In the other match Clacton held the upper hand over Harlow, winning 8-2, Jaz Harvey claiming the scalps 9, 5, 9 over Harry and -8, 9, -7, 9, 6 against Tom and just failing to win the doubles with partner Ben Sivathanu when losing 11-8 in the fifth game. In the final round of matches the top two teams, Southend and Clacton, met but Clacton had the herculean task of needing to win 9-1 if they were to deny Southend the Title. When Southend won the first two matches by the two Matthews, Nariel 3, -11, 7, -6, 8 over Tom and Springer 3-0 over Harry that was it. The Result Sheet states a 7-3 win to Southend but the match scores show it to be 6-4. Whichever is correct doesn’t really matter, Southend still win. On the other tables Colchester and Harlow were playing for the honour of the wooden spoon. Colchester’s two doubles wins and Lewis’s 11-8 in the fifth win over George Campbell were the clinchers at the mid stage of the match in their 6-4 win. Diesel had a good win over Cameron and sister Jaz won both her matches 3-1. Brian Brumwell’s funeral will take place on Tuesday 26th April at 11.45, At St Mary’s Church, Overton Drive, Wanstead E11 2SW. Afterwards there will be refreshments next door at Wanstead Cricket Club . Brian’s wife Sheila has suggested flowers or a donation to your favourite charity for those who wish to. Daniel Robinson in Loughton are the funeral directors. A personal reflection from Stuart Gibbs. I first recalled meeting Brian Brumwell as an 11 year old, when I was given a ticket to watch Essex County 1st team play against the great Middlesex side in 1958 and was fortunate to play with him in my 1st game for Essex which coincided with this being his last game for the county. Brian was a remarkable sportsman who excelled at football and more notably at cricket, as Captain of the Wanstead Cricket Club, the premier side in Essex, where he won numerous trophies. 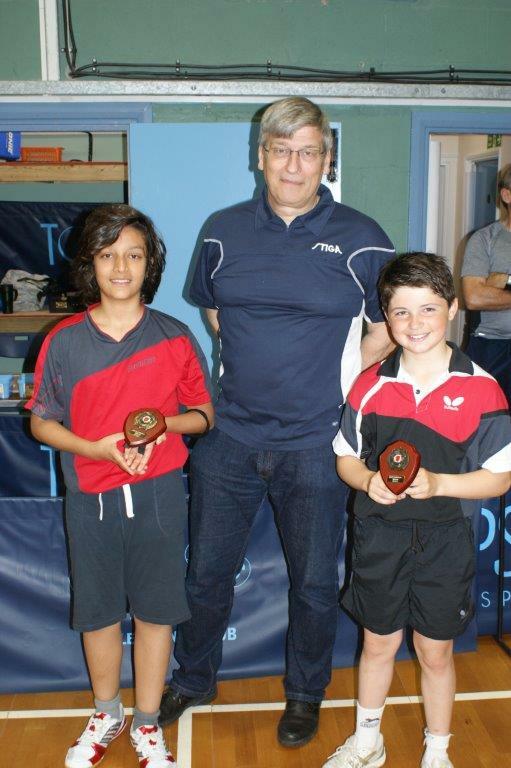 However, it is in his achievements and influence in Essex Table Tennis that I and many, many others will remember him for. Brian played for England on a number of occasions and was ranked No.5 in the Country, not an easy feat when you had such great players to compete with, notably Johnny Leach, Richard Bergman, and Aubrey Simons, to name but a few. During his time as a player, Brian was always ready to help and influence those youngsters making their way in the sport and he became Captain of the England Junior side in 1960. It was a year later that he insisted that the then ETTA include a precocious 14 year old in the England Junior Team to go to the European Junior Championships, as he had recognised the potential of this player. However, he was unable to persuade the powers that be and the request was not granted. As a result of that decision, on principle, Brian resigned from the captaincy. The following year, this young player became England No.1 senior at the age of 15. The player was Chester Barnes. This proved Brian’s uncanny ability to recognise natural talent when he saw it. 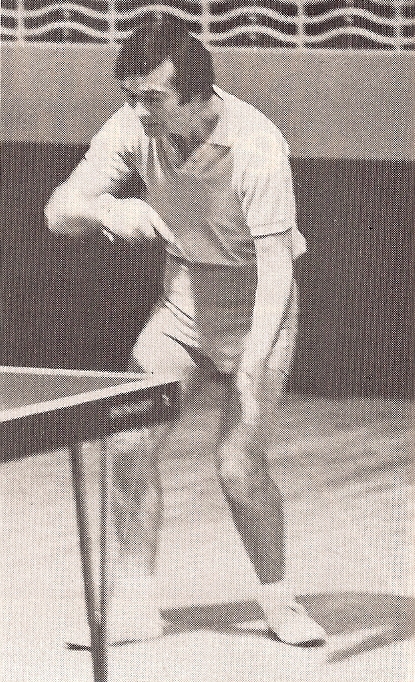 During his time coaching juniors Brian had considerable involvement in Ray Dorking becoming England No.1 junior, at the age of 15 and also helped establish the St Luke’s Table Tennis Club in an underprivileged area of East London, to such an extent that it was able to host England Junior International matches. 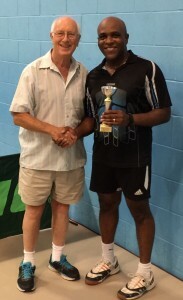 On his retirement from playing nationally, Brian became president of the Ilford and District Table Tennis League and was made a life member of Essex County Table Tennis Association. In closing, how will we remember this great man? He was ferociously competitive, a visionary that was responsible for the golden age of Essex table tennis, in the 1960′s, but more importantly, he was a true gentlemen, with a heart of gold. May you rest in peace Brian and thank you so much for everything you have done.